Southwest Airlines on Wednesday cut its forecast for first-quarter capacity, citing the grounding of the Boeing 737 Max and other issues. The airline sees its first-quarter 2019 available-seat-mile growth to be about 1% annually, down from its previous forecast of 3.5% to 4% growth. Southwest shares fell as much as 2.6% ahead of Wednesday’s opening bell. 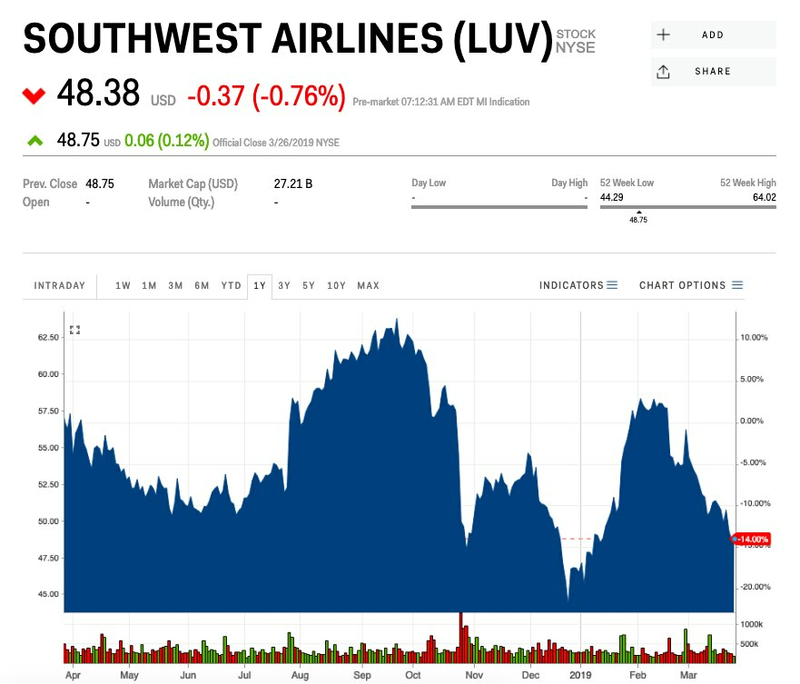 Southwest Airlines on Wednesday cut its forecast for first-quarter capacity, citing the grounding of the Boeing 737 Max aircraft and other factors, sending shares down as much as 2.6% ahead of the opening bell. Southwest says the change to its outlook comes after the cancellation of 9,400 flights — about 2,800 because of the grounding of the Boeing 737 Max and the rest caused by weather and a mechanics strike. The airline said it expected first-quarter 2019 available seat miles to grow about 1% annually, compared with a previous forecast of 3.5% to 4% growth. “Due to the current uncertainty regarding the duration of the MAX groundings and any requirements for reinstatement of the aircraft into service, it is difficult for the Company to forecast the impact of the MAX groundings beyond first quarter 2019,” the airline said Wednesday in a regulatory filing. The airline also expects first-quarter operating revenue per available seat mile to increase 2% to 3% compared with its prior forecast of 3% to 4%. 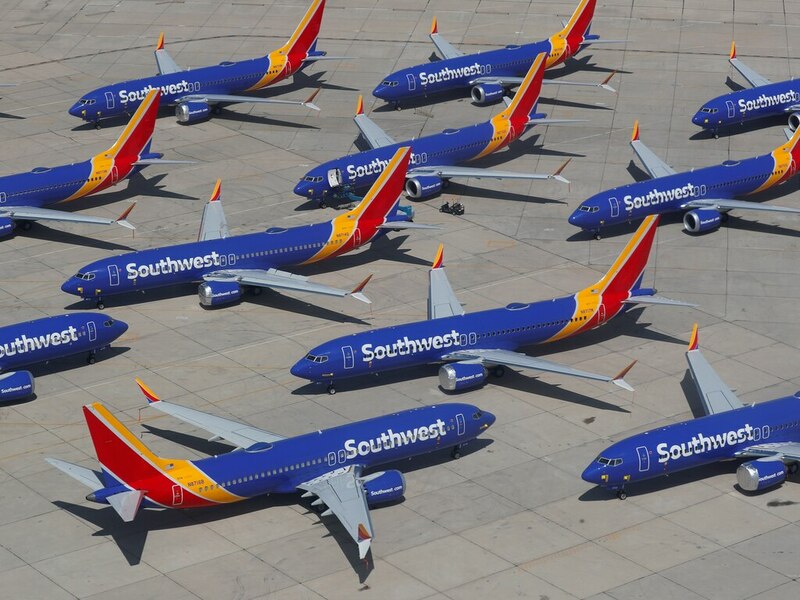 Southwest is the US airline with the largest exposure to the 737 Max. As of March, about 6.3% of Southwest’s available seat miles came from the 737 Max, according to Stifel Financial. That number is projected to climb to nearly 10% by October. Southwest is scheduled to receive 41 more Max aircraft this year and has 221 firm orders, 115 options, and three additional Max deliveries expected beyond 2019, Wednesday’s filing said. In February, the airline warned it would take a $60 million revenue hit in the first quarter over the US government shutdown. It now expects to lose another $150 million of revenue in the quarter because of the events highlighted in Wednesday’s filing. Southwest was up 4.9% this year through Tuesday.